The Black Alliance for Peace (BAP) condemns the announcement yesterday by U.S. Attorney General Jeff Sessions before a gathering of the National Fraternal Order of Police (NFOP) that the administration of President Donald Trump intends to remove the restrictions on the government’s 1033 Program—transfer of deadly military grade equipment to local and state police forces. Jeff Sessions claimed in Monday’s speech that the Trump administration is “rescinding restrictions from the prior administration that limited your agencies; ability to get equipment through federal programs.” However, we at BAP understand this order is meant as yet another green light for increased repression and brutality against Black and Brown working class and poor communities. Therefore, BAP demands that an immediate halt to the racist, repressive 1033 Program and a suspension of all transfers of military grade equipment to local and state police that are currently being processed. Furthermore, we specifically call on members of the Congressional Black Caucus (the “conscience of Congress”), and all progressive-minded congressional representatives, to take a public stand against all aspects of the 1033 Program. The 1033 Program evolved out of the 1990 National Defense Authorization Act (NDAA)’s original authorization to facilitate the transfer of surplus military grade weaponry to state and local police forces as part of the federal government’s so-called “War on Drugs.” In the 1997 NDAA, the authorized transfer was named the 1033 program and it was expanded to include counter-terrorism. 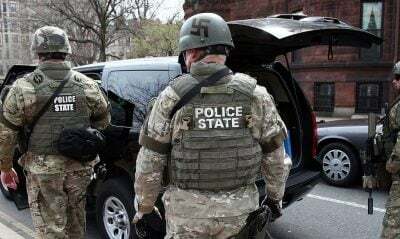 It has been largely responsible for the militarization of police forces across the nation as a result of over $5.4 billion worth of equipment being transferred to state and local police agencies. Pressure from some members of Congress and demands from various organizations associated with the Black Lives Matter movement led to the Obama Administration placing some restrictions on a small class of equipment. But the flow of deadly equipment did not stop. In fact, according to the Department of Defense’s Defense Logistics Agency (DLA), which oversees the transfers, the value of the equipment reaching state and local police agencies actually increased the year after the restrictions were imposed. It is clear that this “domestic weapons supply” program was never meant only to fight drugs or terrorism, but to contain and control Black and Brown bodies victimized by the rapacious consequences of a racist, capitalist order that has rendered whole sectors of the U.S. population disposable. Featured image is from The Crux.